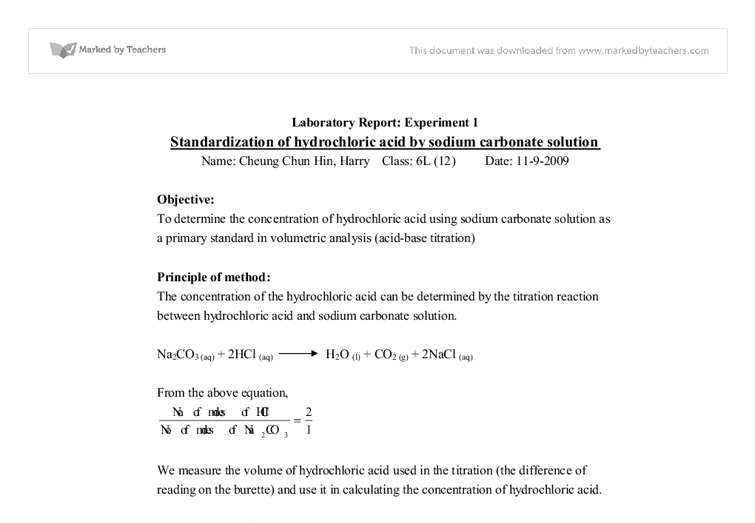 Laboratory Report: Experiment 1 Standardization of hydrochloric acid by sodium carbonate solution Name: Cheung Chun Hin, Harry Class: 6L (12) Date: 11-9-2009 Objective: To determine the concentration of hydrochloric acid using sodium carbonate solution as a primary standard in volumetric analysis (acid-base titration) Principle of method: The concentration of the hydrochloric acid can be determined by the titration reaction between hydrochloric acid and sodium carbonate solution. Na2CO3 (aq) + 2HCl (aq) H2O (l) + CO2 (g) + 2NaCl (aq) From the above equation, We measure the volume of hydrochloric acid used in the titration (the difference of reading on the burette) and use it in calculating the concentration of hydrochloric acid. So the molarity of the hydrochloric acid Procedures: 1. The mass of anhydrous sodium carbonate required was weighed to prepare 250.0 cm3 of 0.05M sodium carbonate solution. 2. All anhydrous sodium carbonate was dissolved in a beaker with a suitable amount of deionized water and the mixture was stirred. 3. Sodium carbonate solution was poured into a 250.0 cm3 volumetric flask and it was made up to the graduated mark using deionized water. ...read more. It was found that the concentration of the given hydrochloric acid was 0.0957M and this result is quite acceptable and reliable because no great error was made in the experiment. The greatest error in the experiment was that when determining the end-point of titration, it was easy to get over the end-point with a few drops. Although the color was still orange, the amount of hydrochloric acid used was different. 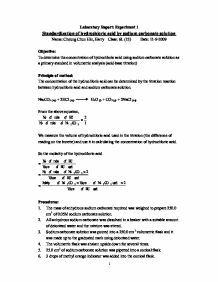 To improve the experiment and reduce this error, it was suggested to repeat the titration for some more times in order to help adjusting the average volume of hydrochloric acid to a more accurate number or to add in hydrochloric acid drop by drop when it was near to the end-point. Thus even a few over added drops can be avoided. In the titration, Methyl orange was used as an indicator in the titrations. When hydrochloric acid reacted with sodium carbonate solution, the reaction mixture became less alkaline. When all sodium carbonate was reacted, the solution became neutral and the methyl orange turns from yellow to orange. ...read more. Also, sodium hydroxide cannot be a primary standard in this experiment since solid sodium hydroxide absorb water from the air so there will be error just like the case of hydrated sodium carbonate. Considering the reaction mixture, if small amount of deionized water was added into the conical flask, it will not lead to an error. It is because the number of moles in the reaction mixture is fixed. When deionized water was added, it will not affect the amount of hydrochloric acid needed in the reaction. Thus the final result will not be affected. However, if large amount of deionized water was added into the conical flask, it may affect our determination of the end-point because the color of indicator may be not clear. Also, lower concentration of sodium carbonate lead to lower reaction rate. The color change of reaction mixture may be slow and lead to over-adding of hydrochloric acid. Conclusion: The concentration of hydrochloric was deduced to be 0.0975M from this experiment. The result was acceptable and thus the objective of the experiment has been fulfilled. - End of Report - Reference: http://en.wikipedia.org/wiki/Phenolphthalein http://en.wikipedia.org/wiki/Methyl_orange ?? ?? ?? ?? 1 ...read more. approximate titre of 30cm3 I will need As these calculations were all based on approximate values I will round 0.083 up to 0.1 mol dm-3, as 0.1 is an easier concentration to make up and will ensure that there are enough OH- ions to react with the H+ ions. However, eye protection will still be used in order to avoid any eye contact given the sensitivity of the eyes. 6 If the solution spills, we will rinse the contacted area with water. If it spills on our eyes, we will flush them with plenty of water. [to ensure no dissolved carbon dioxide gas, otherwise Na2S2O3 it can be decomposed by acids, e.g.H2CO3]. Na2S2O3 can be added to the solution to keep the solution alkaline. Some HgI2 is also added to suppress bacterial action. And the solution then titrated with standard solution of iodine. 8. Potassium manganate(VII) solution was poured into a burette. 9. The initial burette reading was recorded. 10. The reaction mixture in the conical flask was titrated with potassium manganate(VII) solution until it just changed from colourless to a permanent light purple. 11. The final burette reading was recorded. of reaction against concentration is plotted to determine the relation between the two variables. A best fit line is then constructed to relate the x-bar and the y-bar. The proposed model and R-squared value of the model, which is a measure of correlation between the two variables, are also attached.